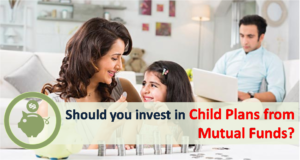 Child Plans from Mutual Funds - Should you Invest? Saving and Investing for children’s education and marriage is one of the most important financial goals for parents. Sensing the importance of these goals a lot of mutual funds, insurance companies and banks have their own version of child investment plans. In this post we focus on Child Investment Plans from Mutual funds, particularly because of the recent buzz around Axis Children’s Gift Fund NFO. As of today there are 6 mutual fund companies offering 9 child investment funds. Axis Mutual fund with its Axis Children’s Gift Fund NFO would be the 10th fund. Franklin Templeton Mutual Fund also had their Children Plan – “Templeton India Children’s Asset Plan- Gift Plan” which was merged into FT India Balanced Fund in June 2014. 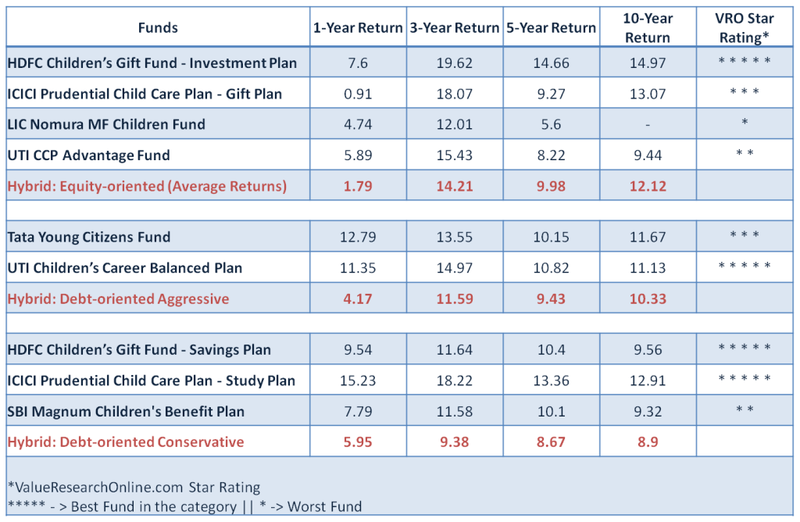 Are Mutual Fund child plans are different than the normal funds? We compare both the funds in terms of portfolio and returns. The table below compares the child plan returns with the category average for different time intervals. The good thing is 4 out of 9 funds have 5 stars while 2 funds are 3 stars rated in their respective categories. But there are also laggards. So it’s mixed bag! Investment in the name of Child: The child plans investment has to be made in the name of child. This means additional KYC needs to be done for him/her. Also once he turns 18, KYC needs to be done again. This is not very smooth transition. We have multiple instances where the investor had to visit mutual fund offices multiple times before the KYC was done. Exit Load: The child scheme has higher exit load compared to their counterparts. For example HDFC balanced funds have exit load of 1% if redeemed with 1 year while HDFC child plan has exit load of 3% in redeemed within 1 year, 2% in case of less than 2 years and 15 in case of less than 3 years from the date of investment. Lock-in Option: Child Gift Funds from HDFC, ICICI, TATA, Axis provide an option of lock-in. If you opt for the same you cannot redeem the fund until the child turns 18. 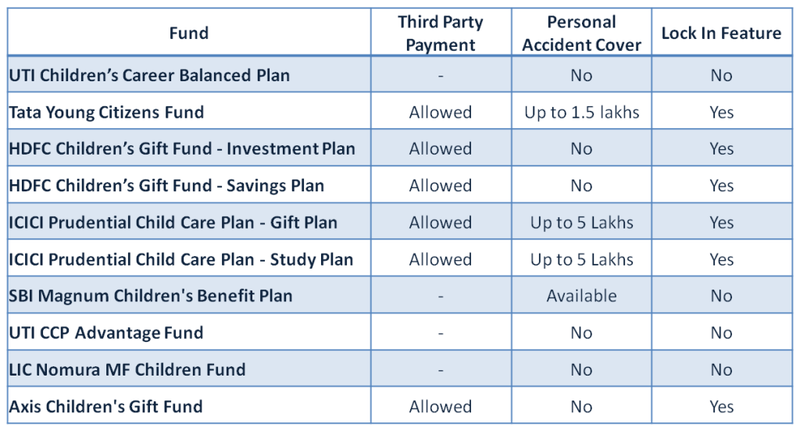 Personal Accident Cover: ICICI Mutual Fund provides accident insurance up to 5 lakhs while TATA mutual fund has accident insurance up to 1.5 Lakhs. Third Party payments Accepted: In case of normal mutual fund investment the investment should be made from the investors’ bank account only. No third party payments are acceptable. However in case of child plans from ICICI/Axis third party payments are allowed. So even children grandparents, relatives can buy these mutual fund units as gift provided they meet the KYC norms. 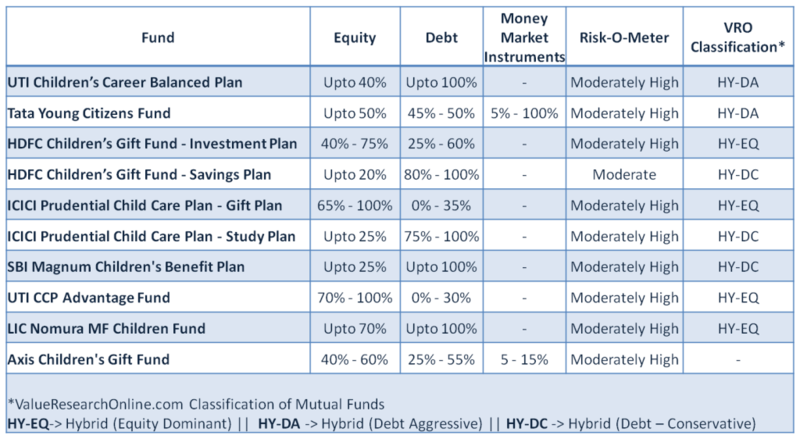 As can be seen, the investment strategy and returns of the Child Plans are similar to general mutual funds within the same category. The good thing is according to Value research 4 out of 9 funds are 5 stars rated and 2 are 3 stars, which indicates good historical performance among their respective categories. In some of the child plans you can lock the withdrawal till the child turns 18. This can be good or bad depending on your personal behavior and situation. Funds like ICICI, TATA and SBI offer small personal accident insurance – which should not really dictate the decision to choose a particular fund. Some funds like ICICI and Axis child plans allow gift of units from third party too (provided they are KYC Compliant). So if child grandparents or relatives want to contribute, child plan makes sense. Though as a work around relatives may also contribute to the Child’s bank saving account, which can be invested in any mutual fund. Among all the child plans from Insurance companies and banks, etc named as “Child Investment Plans”, Child plans by Mutual funds are better off in terms of long-term performance and transparency. All said and done, many people face issue while redeeming the fund after the child turns 18 because of KYC issues (of the child). You might have to do a lot of follow up with the mutual fund office. Personally I don’t see any reason to specifically choose funds named Child plans. Regular investment in good portfolio of equity and balanced mutual funds can help you reach your child related goals. Invest without the bias if the fund name has “Child” in it or not. aNY tax benefit from these funds? No Tax benefits from Child plans. Click here to know about tax saving mutual funds. I prefer to stay away from such funds, rather will stay happy with diversified equity funds.